Brief Description: Mjolnir is on the short side, and quite stocky, standing at about 5'6" and weighing in at 285lbs. He has long, red hair that he keeps in loose braids, and steel grey eyes. He is rather boisterous, though is still unaccustomed to life as a human. Additional: Mjolnir is best described as stout. Mjolnir is a stout fellow with long, dark red hair. He has some facial hair that he keeps neatly maintained, often with a few beads or rings in. Mjolnir is boisterous and always ready for a good time! His long years spent at Thor's side has given him a taste for beer and mead, preferring them above all others. Hard alcohol is all well and good, but half the enjoyment of the drinking is tasting it! With Hammer and Fist! - (6) Brawn Always up for a challenge, Mjolnir is practiced in melee combat! Willpower - (4) Resolve Being an inanimate object has helped temper Mjolnir's Will. Freedom/Movement - (4) Finesse Being imbued with the essence of lightning makes Mjolnir quick despite his appearance. Reflex - (3) Finesse Being imbued with the essence of lightning makes Mjolnir quick to react and get out of the way. Socialize - (2) Charisma Mjolnir is accustomed to the raucous life of the mead halls. Vitality - (5) Brawn Mjolnir's artificial body makes him resilient to damage. Mjolnir lived a long life as the companion to Thor, and he is still mostly a hammer. Being hurled into Midgard has granted him the ability to take on a human and hybrid form to be able to blend in. Hammer - Turns into a hammer. This hammer is an artifact and grants the wielder +1 -Parry at ranks 1,4,8 , this hammer does power based damage and bypasses mundane armor as such. It has a damage of +1 and is a medium melee weapon that has extra armor piercing at ranks 2, 4, 6 of this power and is able to be thrown and always return to the wielders hand. When thrown wielder may use melee skill instead of throwing skill. While in this form Mjolnir may communicate telepathically with his wielder. Can only be wielded with Mjolnir's consent. Mjolnir was imbued with lightning at his creation. Thus, he is gifted with some control over it. Synthetic Body (4) - // You do not need to eat, drink or sleep, and you are immune to poison and disease, as well as most biological agents. You do not heal naturally, but can be 'repaired' with the right skills. 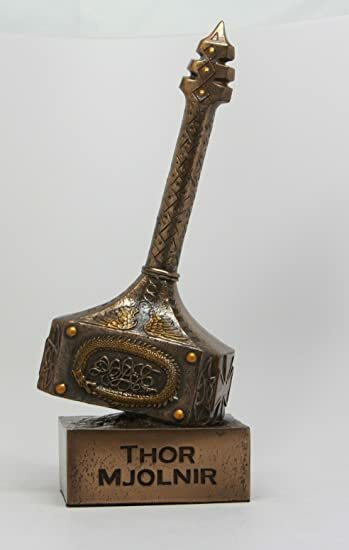 Mjolnir was forged for Thor by the dwarves. Mjolnir was friend and companion to Thor for countless years, accompanying him on countless adventures and quests. Even when stolen or misplaced, Thor always came for him. When Mjolnir gained sentience, he truly became Thor's friend rather than a beloved tool. After Gungnir, Mjolnir's brother, was thrown to Midgard as a Human, Odin approached Thor and asked that a companion be sent to the mortal realm to accompany his beloved spear. Thor, understanding Odin's sentiment, agreed to send Mjolnir to the realm of humans. Despite Mjolnir's protest, his fate had already been decided, and he would be sent to accompany his wayward brother.